Best coolant for our 60-70's Mopars? Doing a drain and refill on my 73 Dart....any likes/dislikes of coolant brands available at auto parts stores that won't harm the innards of our vintage cooling systems? "Our cars" aren't any different than any other cast-iron block & head motors. Aluminum corrodes faster, which killed most of the early aluminum block slant six's. It is still a problem with the aluminum timing cover on our small blocks. The one on my 65 273 was almost corroded thru. Even more concern if you install an aluminum radiator. I am slowly converting all my cars to Evans Waterless Coolant, to put corrosion behind me. So far the M-B are the only ones I have driven much and the temperature stayed in spec even on the steep I-5 grade over "the Grapevine" on a >100 F day. Jay Leno and Ed China (Wheeler Dealers) like it. "Our cars" aren't any different than any other cast-iron block & head motors. Aluminum corrodes faster, which killed most of the early aluminum block slant six's. Wasn't the problem that people would use just straight tap water? i remember reading an article about those aluminum sixes that mentioned that. But yeah, I just use the green stuff, works just fine. I use Evans coolant! Best Sh!t ever!!!!!!! I've been considering running Evans in my new engine with my new aluminum radiator. The only thing stopping me is the $65 per gallon asking price. Anyone know of someone selling cheaper than that? Here's the route I went on the Evans. Some of you guys may need the high dollar Evans coolant. It appears the OP just has a 73 Dart that he wants to drain and refill. Plain old antifreeze will work just fine. Change it out every couple years with some conditioner every year in between. It has been used for decades in millions of vehicles without problems. Definitely Evans. Read the detailed "why" of it here. Whoever's asking $65/gallon can keep right on asking; that's about 50% overpriced. Their product names have shifted and drifted a little through the years; the one you want is their "High Performance" coolant, gallon or 4-gallon case. Never use straight tap water, it will form mineral deposits. Always mix antifreeze with distilled water to prevent this. Open the radiator cap, if you see white particles stuck to the radiator tubes it is mineral deposits. What's in Evans that makes it so much better Dan? I just read the article. No water. very interesting. I will say the Evans coolant sounds like good stuff. I have a hard time justifying the cost though. My point is: how many millions of engines have lasted 100,000+ miles with ethylene glycol coolant in the system and the original water pump and hoses doing their job. Thanks for the links Dan. Good reading as usual. BTW the link you put for the gallon of Evans is $50, that's not 50% of $65. It's obviously cheaper by the case. My question is, is four gallons really needed? Especially if it never goes bad. Things change, progress is made. Hundreds of thousands miles were logged on old bias ply tires until someone invented the radial tire. I know that we've gotten off topic from the OP's question, but what the hell, we're already in waist deep. It is my opinion that ethyl glycol would work fine in his instance, stock heads, stock radiator etc. In my build though, I have aluminum heads, radiator, water pump, timing cover all that are gonna be effected by the corrosion that occurs with dis-similar metals and water. 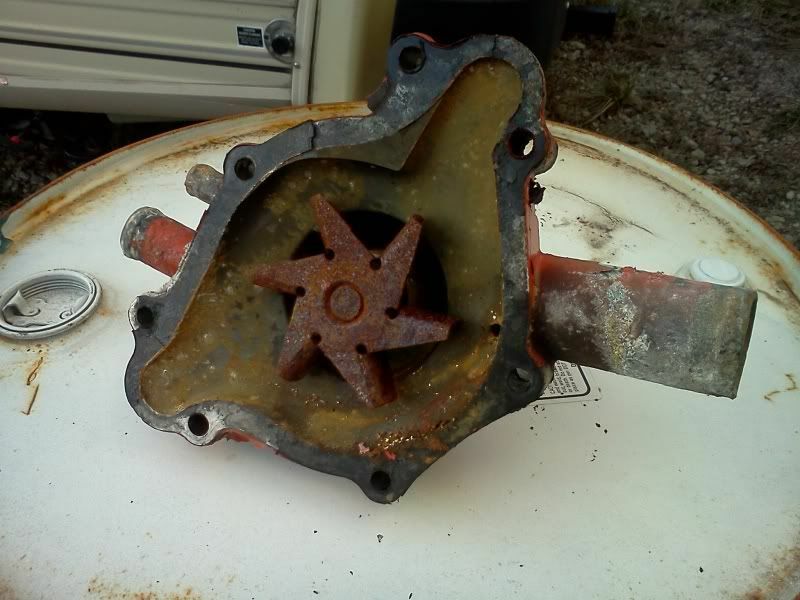 Here is a pic of a water pump that we pulled off a crate motor that the guy swears was well maintained. Plus, with no water there is no steam. That means no pressure building up in your cooling system which means no more blown hoses. They may get a pin hole and drip, but they aren't going to split wide open and leave you stranded. So I guess the answer for me and some others is yes, Evan's Waterless coolant is a via option for us. The price of Evans coolant is higher. The cost is lower. As for the price, I was going by the case price at the link ($44/gal). 65 ÷ 44 = ~1.47, about 50%. How much to buy: Well, cooling system capacity is 13 to 16 quarts (with factory radiator) depending on engine and radiator sizes. Four quarts in a gallon, so buy four gallons and you'll either have precisely enough or you'll have enough plus enough left over for minor top-ups over the years. I've got a couple of cases of EVANS waterless sitting in the garage. My plan is to put it in each one of our cars. Unlike regular antifreeze that is supposed to be changed every few years, the EVANS is supposed to never need changing. It isn't supposed to break down and fill the bottom of the block's water passages with crud like antifreeze that never got changed. I put it in my Duster and Barracuda because it doesn't boil over. That means I don't have to worry about the radiator puking out fluid at the drags anymore if I start to run hot. You can remove the radiator cap without ever having that pressure build up that would turn your car into a geyser. I probably wouldn't even run an overflow tank now except it's required at the track. We're running aluminum heads, water pumps, intakes, and radiators. It's nice to know this stuff will stop them from corroding. I paid $52 per gallon. If you compare the one time cost of EVANS to the cost of replacing regular antifreeze every few years, it's cheaper in the long run. This video from Jay Leno convinced me. The only downside to this water less stuff is if you have a failure you can't put water in or you ruin the stuff and the coolant system has to be as close to water free when you add it [great for new builds] i thought about using it with a new build but it's not cost effective for me. If you watch all of that Jay Leno video that I posted you'll see that it can still be saved after you've added water. It would be a b#tch to do though because you have to boil out the water. Most brands are close, even the house brand. there are only a couple plants that produce antifreeze. Get whatever you like But drain and refill every two to three years thats the key to a clean system.